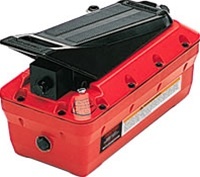 3-way heavy duty air valve provides fine control when lifting or lowering a vehicle. 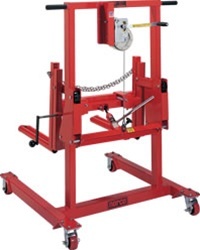 Automatic safety lock engages in 5 different height positions independent of air pressure. 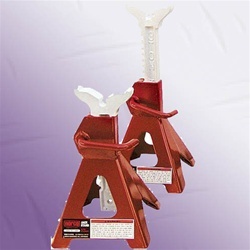 Includes extension tubes and adjustment pins for added height requirements. Two 10-inch diameter solid wheels are strategically located for better positioning and maneuverability. Scissors action frame design with four 5-inch diameter steel wheels provides maximum stability during lifting and lowering. Large air cylinder requires only 100 p.s.i. air pressure to lift 5 ton capacity. Over 4 feet of reach between cylinder and center line of lifting saddle. 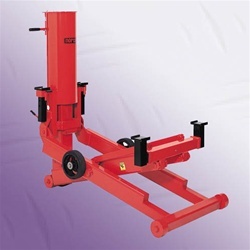 Capacity @ PSI – 5 Ton @100 7 Ton @150 8-1/2 ton @180, Unit Height – 83.5", Width – 38", Maximum Width – 47.25", Lifting Height – 50". Be the first to review “NORCO 82995 8-1/2 TON CAPACITY LONG REACH AIR LIFT JACK” Click here to cancel reply.